Did Video Games Help Me Accept Inception's Ending? The struggle people are having with the ending is sorting out what the next moment would be after the final scene. The final scene of the film makes it clear that one of two possible events will happen next. 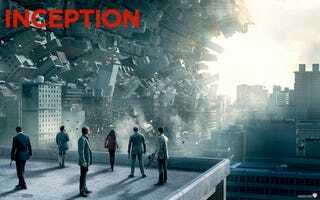 Some Inception viewers are convinced that event A will happen; others that event B will happen. I've been surprised people are so determined to deduce which ending is the real ending. But, I've realized, it's odd that I'm happy not to know, odder still that I'm willing to think that both endings happened and that I don't stress over which is correct. The reason I might be okay with believing that Inception has two equally valid truths to its endings is, possibly, because one of the main forms of entertainment I consume often includes works with equally valid endings. In video games, Mass Effect can end the Paragon way or the Renegade way. Both are valid. Both are accepted as true when you play Mass Effect 2. Fable II can end in three ways, and all are, in my mind, the "reality" of the fiction. I don't worry that the way the video game ended for me was not the right way, nor that the way it ended for someone else is more or less the truth. There was a time I cared whether there was really a cat in Schrodinger's box. Today, I don't worry much whether Inception's next scene is one way or the other. I accept both as true. I don't see a mystery; I see a valid branching that leads to two equally valid realities. Is that what happens to those of us who consume not just books that traditionally have only one ending, but video games, which commonly have two or more?